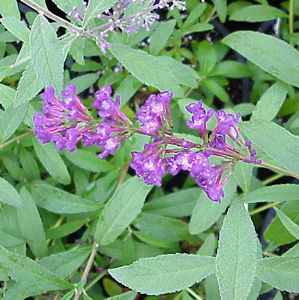 Buddleia spp. is native to China. The branches arch and have narrow cone-shaped bunches of flowers on the tips of the branches. Buddleia davidii ‘Black Knight’ is a superior selection of Butterfly Bush with the darkest flowers available, a deep grape purple color, which are quite striking. The flowers attract butterflies that feed on the highly scented nectar occurring in late summer or early fall. It is recommended that this plant be pruned in late winter to encourage shoots coming from the bottom of the plant. These canes are usually stronger and produce larger flower heads.